That's a great line, from a great movie. A Plague so Pleasant. I must say i am still a fan of zombie films. Sure there is an overabundance of them over the last few years, but that's due to the success of The Walking Dead. The one good thing though is more and more filmmakers are starting to do things a bit different with zombie films. We have seen some funny ones. One with zombies as pets, even one with Bigfoot. 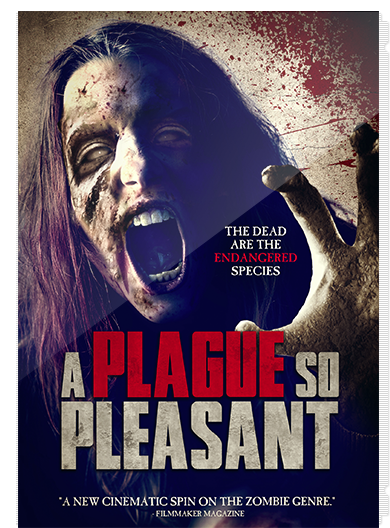 A Plague So Pleasant is another one that offers a fresh spin on things. In this reality we learn via narration from the star of the film Clay, that when the zombie apocalypse hit, it only lasted a couple hours. In fact zombies aren't even bad guys, just defensive when you want to kill them. Hell now your not allowed to kill them, there a protected species. They stay on reservations, although they also do wander around. So much in fact at jobs now you have to watch zombie safety videos. Anyway Clay's sisters boyfriend died a while back and now he's of course a zombie. Problem with that is she still loves him and won't move on. So Clay figures he can go to the reservation he's on and Kill him for good so she won't keep visiting and finally move on. What happens after that is pretty straightforward. Plan goes wrong, Clay gets trapped, and a bloodbath ensues. And let me say the make up work is pretty impressive so such a small budget production. This film is great. I also dig how they beginning is done in black and white, almost paying tribute to the old school before changing over to color for,the new era to begin. Overall a great new spin on a timeless style.